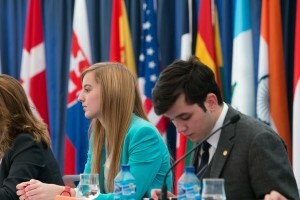 Madrid International Model United Nations is the first international Model United Nations to take place in Madrid with UN backing. It is organised by Camilo José Cela University (part of the SEK Educational Group), with the effort of a group of students with wide experience of the world of Model United Nations and of professionals with knowledge of the world of diplomacy. Our aim is to create a Model United Nations of reference in Spain and Europe, with the highest quality standards. If you have any queries, write to us using the contact form. At this moment, we are working on the 2015 edition of the Model, which takes place from October 26 – 30. On this blog site, we will keep you informed of the latest news about the Model. Meanwhile, you can find information about it in the FAQ’s section and if your mind is already made up, don’t hesitate to enroll by filling out the corresponding form.